I love Lady Gaga. If any of you have not seen her documentary, Gaga: Five Foot Two, I recommend you flipping on Netflix and adding it to your queue the second after you finish reading this post. Speaking if which, following are a few thoughts in word form to describe the week that was… last week. It rained all over southern California, which is not surprising since we are pressing up against Winter’s door like a pack of seven year old Trick-Or-Treater’s, but it rarely drops below 50F during the sunlight hours in LA, ever, yet it hovered in the high 40’s all day; it was thrilling. I am ready for you, Greenland. I dipped my toes in two pools that day, but only swam in one. That is not meant to be a clever riddle it is the truth. Apparently, pouring sheets of rain was kryptonite to the lifeguard on duty at the long course pool I chose to swim at, (he couldn’t see the bottom of the pool), because two seconds after I submerged myself into the pool, they shut it down. Annoyed, yet undeterred, I drove another thirty minutes back to our club, which houses a short course pool, (a perfectly suitable option any other workout of the week, but this particular workout called for a long course pool). Thankfully, our club never posts a lifeguard during mid-Summer, sunny sky, and toddler packed pool conditions, let alone during a mid-December monsoon, so I swam undisturbed. That inconvenient, yet non-detrimental bump in my schedule, along with a freeze of my Blog page on my website last Tuesday, was my biggest concern over the last seven days. There are a few dozen highlights that deserve some airtime here. For example, waking up and going to sleep next to my sweet hub Monday through Sunday, waking up at all every morning, really running again, watching the post I wrote last week on my blog about the Outspoken Summit being read and spread around the internet by more than a handful of women I respect and revere, and finally driving for hours on Sunday out to the desert and back listening to Christmas carols and R&B in the pursuit of cheering on my friends and teammates at the inaugural Ironman Indian Wells, 70.3 triathlon. I am proud to report that ALL of my teammates had a smashing day, and it was an absolute joy to watch them get after it in person. From left, my teammate's professional triathlete Alyssa Godesky, and her athlete, the amazing, Jennifer Madeline. It also served as a needful reality check; I need to go to work hard and soon in order to be able to reach within striking distance of the pro level. 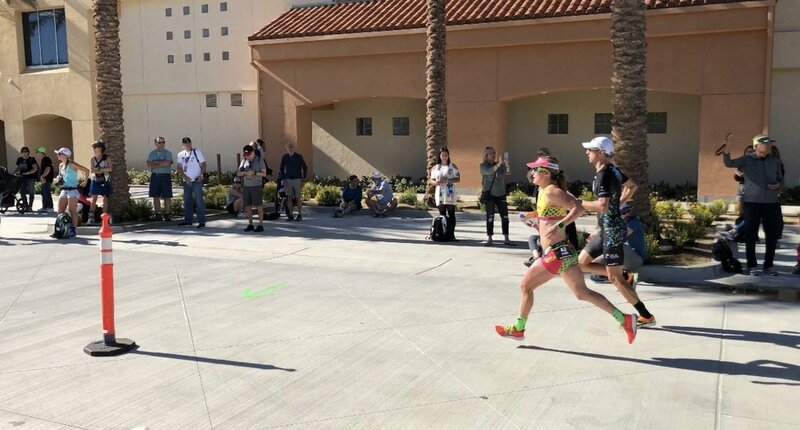 The super swift Smashfest Queen sponsored pro triathlete, Haley Chura, on her way to a 2nd place finish. But first, I need to go to Texas. That’s right! We haven’t quite called, “Wrap!” on this year of whirlwind travel, because the entire SoCal Spates family, Marion, Hannah, Guinness, Blueberry, and yours truly, are planning to load up our Black Jeep Wrangler and roll out to the big, wide state of Texas to spend Christmas with Marion’s family in El Paso. We have not spent Christmas in the Lone Star State since 2007, and even though the decision to go was abrupt, I usually prefer months of planning and prep, I am excited to go. Marion’s sister, Ecklyn, is one of my favorite people on the planet, and seeing the joy on my mother in law’s face when the entire family is together is priceless. Plus, I really miss Hannah. She is almost twenty, but some days it feels like she is thirty-five, or nine, either way, we keep missing each other, literally and figuratively, never finding or making the time to share space together; this trip will provide that time. In the meantime, I have a couple of interesting happenings popping up this week and next that I look forward to reporting on before we wave 2018 adieu.